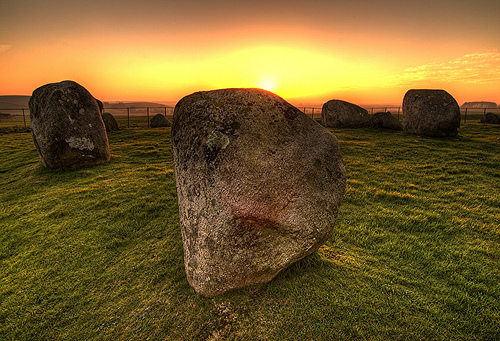 The Standing Stones of Torhouse are a circle of nineteen granite boulders, three miles west of Wigtown. Local tradition maintains that it is the site of King Galdus's Tomb. Galdus is believed to have fought off the Romans in A.D 80 and is credited as being the source of the name Galloway. The central stones are supposed to mark his burial place. In the dyke near the stone circle is a stone with a deep cavity which, in ancient tradition, "the knowing never pass without depositing a stone or pebble therein, as a gift to pass in peace". During Galloway's horse fair, hundreds of stones are deposited in the cavity. Typically, three of these stones will contain a pawn of rego vis. The stones are set on their ends with three larger stones placed in a line in the middle. This is the only stone circle of its type in the Machars area and is of a type more akin to those found in northeast Scotland or southwest Ireland. The site is on slightly raised ground, and appears to have been used as a dumping ground for stones from neighbouring fields. The diameter of the circle is between 61 and 66 feet, and the stones lie at distances of between 5 and 11 feet from one another on the perimeter. The stones on the west side are smaller and are more closely grouped than those on the east. The three boulders on the interior of the circle (an unusual feature in stone circles) comprise one comparatively small stone in the centre flanked by two greater stones. The central stone is slightly tilted and is 2 feet 10 inches tall. Its two neighbours measure 3 feet 4 inches and 3 feet 9 inches. The direction of the line of the three central stones is northeast to southwest. Three standing stones to the north supposedly mark the burial sites of three of Galdus's generals who died with him in battle. Nearby are several cairns which it is believed mark the burial place of his common soldiers. The area within the stones has a faerie aura, through no faeries are known to inhabit the site.